I’m surprised that Amalfi has no naval museum, nothing to remind us that Amalfi was one of the four maritime republics of medieval Italy. That fact is recalled by the presence of the Amalfi coat of arms on the modern flag of the Italian navy, along with the other three: Pisa, Venice, and Genoa (all of which have naval museums, I bet—but don’t know). That is a quiz show question, by the way: Name the four maritime republics of medieval Italy. Almost no one remembers Amalfi. BUT see last entry on this page! OK, I checked. Genoa has TWO! ; Venice, one; Palermo has turned the old Bourbon shipyards into a naval museum; Trieste has one; Nardò, near Taranto, has one; Bologne has one, as does La Spezia, Imperia, and Caravaggio (not the painter, the town. See 45° 30' N, 9° 38' E). Pisa? I’m not sure, but at least they have that tower thing. But Amalfi? The place where the first Maritime Code, the so-called tavole amalfitane, was formulated, a code that regulated maritime trade in the Mediterranean for 500 years? The place where Flavio Gioia invented the modern compass? (Or so they say.) They have a Farming Museum and a Paper Museum. Go figure. Founded in 1992 as part of the Nautical Technical Institute “Duca di Abruzzi”. 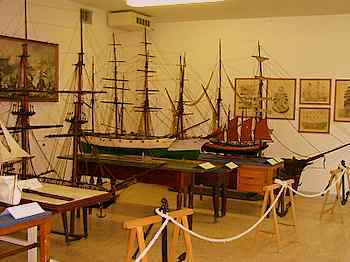 The museum hosts a collection of models, nautical instruments, and a library. (The above photo is of a display in the Bagnoli museum.) Contact: Via di Pozzuoli 5, Naples, tel: 081 617 3749. Founded in 1996, the museum is housed in the 17th-century Palazzo dell’Orologio in the historic center of the town of Ischia Porto on the island of Ischia. The displays occupy seven rooms on three floors. There are exhibits of nautical instruments, naval uniforms, model ships, a philatelic exhibit of stamps dedicated to the sea, and a photographic exhibit dedicated to both the maritime navy and commercial fishing fleet. Given the Greek and Roman history of the area, the museum houses, as well, a display of maritime archaeology. Contact: Via Giovanni da Procida, 3, Ischia, tel: 081 981124. This facility is mostly a historical library dedicated to the commercial fishing fleet on the island, a traditional occupation of the people of the island. As well, there is a section dedicated to maritime religious rituals. The facility is administered by the Museum of the Sea on Ischia. Contact: see Ischia (above). As of 28 December 2010, Amalfi has a much-needed museum: The Museum of the Compass and the Maritime Duchy of Amalfi. See this link. Contact: Largo Cesareo Console, 3 - 84011, Amalfi, Salerno, Tel: 3663423409.